Los Angeles: The City of Better Angels? What if Los Angeles became a city of angels? Or of “the better angels of our nature” as Abraham Lincoln exhorted us to become? What would happen if we truly became “the City of Our Better Angels”? To ask “what if?” is not just idealism or false hope or fantasy. “What if” questions are filled with hope and faith while acknowledging our struggle for that quest. To ask “what if?” today is to say, “I have a dream.” What I call “culture care” is a non-violent resistance to culture war; culture care is not to wage war over territories of culture which only leads to polarization, but it is to lay down the weapons of ideology, and instead to sow seeds of goodness, truth, and beauty into the ecosystem of culture—into the cultural soil of our cities, including Los Angeles. In that city of God, the better angels of our nature imagine and invoke the future. In our current city of man (as St. Augustine would have it), culture wars rage, dehumanizing forces invade, and polarizing specters abound as the accursed ghosts of our divided past and present haunt us. But in the city of God, the city of our better angels, invitations arrive for Genesis moments—offered even in our brokenness. What would that city look like? It might be much like the Highline of New York where nature has been reunited by culture caregivers with the daily rhythms of that great city. Or it might look like the gardens of Ron Finley, “A Guerilla Gardener in South Central LA” introduced to many through his TEDtalk. Or Roberta and Howard Ahmanson’s “Village of Hope” a 192-bed transitional housing program for homeless men, women, and children brought to life on a decommissioned military base. It would look like all of us—homeless, exiled, forgotten, and enslaved gathering to march toward freedom, justice, poetry, and beauty. No one wins in culture wars. Culture is not a territory to be fought over, instead it is a garden to tend to, an ecosystem to care for. Each time we battle for what we consider some “sacred right,” we lose ground by dehumanizing and demonizing the other side. A culture-war stance assumes an “us verses them” situation in which every position must be monolithic and dominant. It requires the investment of so much time and resource to defend absolutes rather than collaborating, negotiating, and finding common ground. Culture caring rejuvenates culture by aspiring to the greater good, actively mediating and guiding people through the darkness of injustice. What we are experiencing this election cycle is but a disfigurement of democracy. Instead of aspiring to the “better angels of our nature,” we have become dark, mutated angels fallen to the temptations of culture war. Mr Trump, I suggest, is fallout from those wars, a gusher erupting from the fissures of culture wars. He successfully took advantage of culture war polarity to focus the media on himself and his own ideas of “winning.” He gained this dominance first by intentionally firing incendiary remarks to pressure the fault lines of culture wars, recasting everyone other than himself “losers” from the starting line. We may yet be able to elect the culture wars candidates of our choice, but we all lose in that process, degrading the integrity of our culture in the process. No matter who wins this election, an age of disillusionment will be ushered in with the new occupant of the White House. Culture Care is about nurturing the good, true, and beautiful into the soil of culture. Reinhold Niebuhr stated that “Democracy is finding proximate solutions to insoluble problems.” The growth of democracy requires the good soil of culture so that “proximate solutions” can further the privilege of stewarding culture. The goal is not to “win” at all costs—democracy never claims to resolve,insoluble problems no matter who the leader is. Niebuhr also warns us: “Nothing which is true or beautiful or good makes complete sense in any immediate context of history; therefore we must be saved by faith.” Culture Care is generational work, and will require much faith. I want to suggest one “proximate solution.” What if we spent 1% of the budget for this current presidential election cycle, and created gardens of culture for the generations after us? What if we elected not politicians but cultural gardeners? A gardener is judged by the fruit they produce. An election should be like a farmer’s market: whoever produces the best fruit in our culture should sell the most fruit. With that 1% we would be able to fund all of the worthy arts organizations and cultural entities I support, from Image Journal to the Jose Limon dance company, and make them sustainable. Politics are downstream from the arts. What happens in culture upstream can affect the whole river. Let me further suggest that if we up the ante and redirect 10% of all of the campaign spending for the elections happening this year (including Super PAC) and apply it to culture, it could make sustainable ALL of the organizations in the United States, including every organization funded by the NEA, NEH. That amount would fully fund NPR (imagine not having have to listen to their fund-raising campaign pitches!). I dare say that this 10%, used generatively and resourcefully, with care of a master, proven gardener, would do more for the thriving of our culture, the thriving of our economy, and the thriving of world cultures than anything that this election will yield. So according to this model, Mr. Trump will have to show that he not only succeeds in negotiations and firing people, but show that the fruit of his work actually tastes better and is more nourishing for all people. It’s no different for Secretary Clinton. She will have to do the same. What cultural fruit has she made that is enduring, what fruit has she nourished that causes not just registered democrats to benefit but the entire ecosystem of culture to thrive? The city of our better angels is lush and abundant: let’s give up a small portion of our ambition, lay down our weapons of ideological polarity for an apportioned time, and devote our energy to tending the soil of culture right beneath us. In a land tainted by radioactive isotopes of apocalypse, fear, and anxiety, we must plant sunflower seeds of hope, like this painting of Vincent van Gogh. 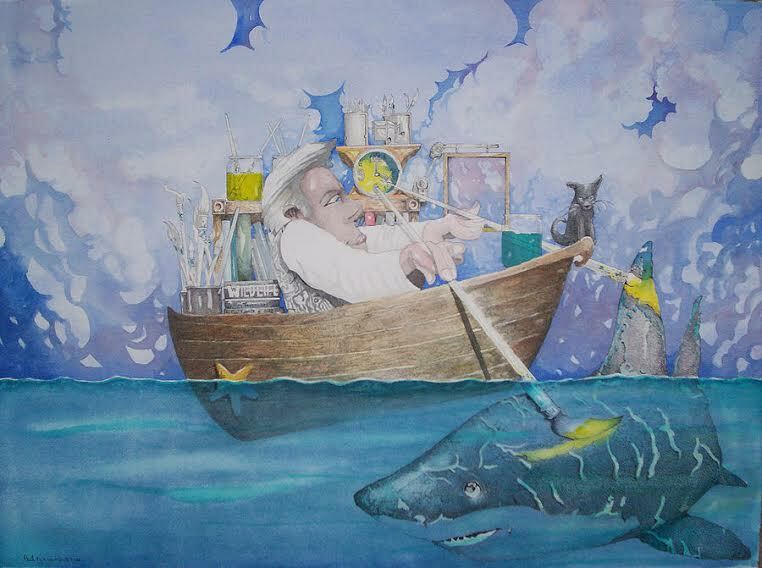 (see above image) “I dream my painting and I paint my dream,” he said. Let’s cast our “what if?” dreams into the wind of culture instead of pinning hopes on our leaders, or an establishment ready to break apart like an old wineskin. Let’s become gardeners of cultural farms, stewards of cultural ecosystems. To nurture the soil of culture, we must learn to see with “the eyes of our hearts” (Ephesians 1:18) beyond fear, beyond anxiety, and beyond despair. Be patient and long-suffering; love deeply; nurture the soil of imagination, gestating in faith until we can give birth to that city of our better angels. What if we did that? We would find a city filled with the aroma of the new, emanating out of the extravagant, with denizens like bright flowers turning their heads toward the sun. Out of the trauma of our times and the disillusionments of our days, God would birth something true, good, and beautiful. Over 150 attendees came to the first Culture Care gathering at the Brehm Center in Fuller, which took place March 3-5. We are scheduling three of these gatherings—the next one will be a Culture Care Summit, taking place February 10-12, 2017. What we experienced was a significant movement of the Spirit among artists, entrepreneurs, theologians, and pastors. Keiko Yanaka came from Japan to be the “still point” by serving the Rikyu style of tea (specifically Omote-Senke style) in the Brehm|Fujimura Studio. As we converted the small exhibit space attached to the studio, I realized that the tatami mats fit perfectly in the space, and the three paintings I had been working on as a meditation in the Lenten season,which also happened to fit perfectly. Keiko said that she was amazed that the Brehm|Fujimura spaces were echoing the tea houses; the entry rooms prepared the hearts of those receiving tea through stages of meditative/prayerful zones. As you will read in my new book Silence and Beauty: Hidden Faith Born of Suffering, Rikyu is a prototype of resilient faith operating covertly and deeply embedded within culture, and our task is to uncover and reveal some of the Eucharistic elements of tea. The response by the guests were so overwhelming (she could only serve 25 people) that we plan to have her back for next year as well. We will also focus on Shusaku Endo’s book Silence—now being adapted by Martin Scorsese (the movie is due out in December)—tracing the roots of Japanese aesthetics born in the time of persecution and strife. As my Q Conference message says, we are entering an age of disillusionment and persecution, so we have much to learn from those who created “still points” in such a historic setting. The Culture Care gathering invited many from around the world, and featured Dr. Mark Labberton, the President of Fuller Seminary, whom I interviewed on stage. 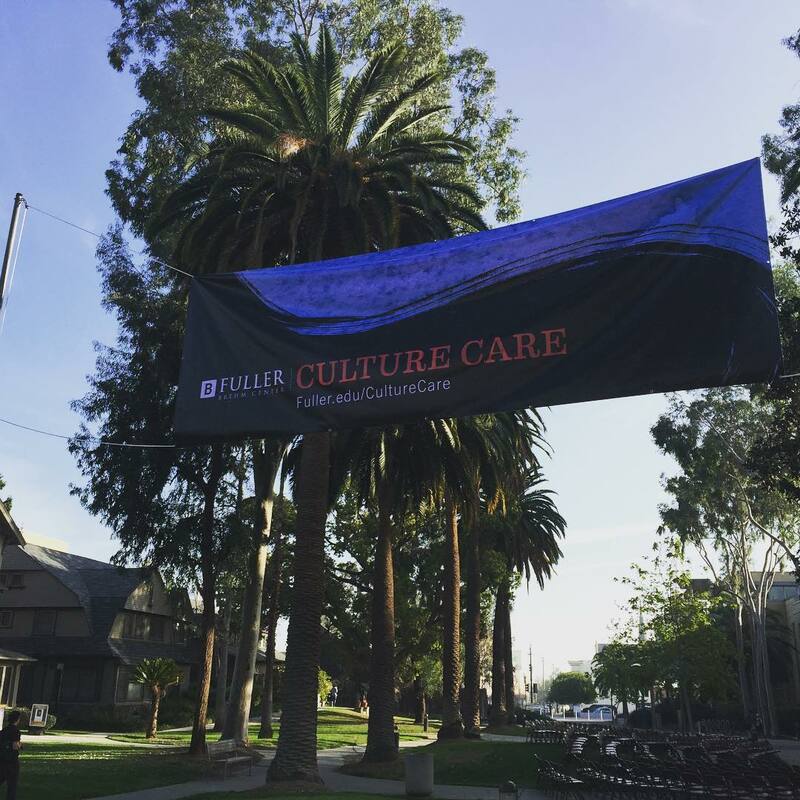 Implementing the principles of Culture Care into the full curriculum of Fuller Seminary will take time, but we are off to a great start. I have identified a few students with whom I hope to work closely as Fujimura Fellows, with the eventual goal of establishing master’s and doctoral-level curriculum for Culture Care. Other presenters included artist Pamela Alderman and retired Army sergeant Ron Kelsey. The afternoon highlights included Professor Alexis Abernethy, a professor of clinical psychology, who reported on her research on the relationship between worship/prayer groups and trauma recovery in the Bahamas. The director of Spiritual Development at Fuller, Dr. Laura Harbert, also join us on stage to lead the sessions as a responder to the presentations. I asked Alexis’s church’s worship director, Dr. Dianne Clayton-White (“Dr. D”), to close the gathering with her music as Dr. Harbert began to pray. God visited us in a special way in Travis Auditorium at Fuller that day. With tears and our hearts full of joy, we concluded the gathering. The experience was so powerful that I later met with Dr. Ed Willmington and suggested that we organize next February’s Culture Care Summit as a worship service. Dr. Willmington, being a composer and worship director dedicated to the next generation of worship leaders, said, “Now you are speaking my language!” I anticipate that this will be unlike any arts and faith conference you have ever attended, a weekend full of worship, Culture Care, and learning, so please mark your calendars! 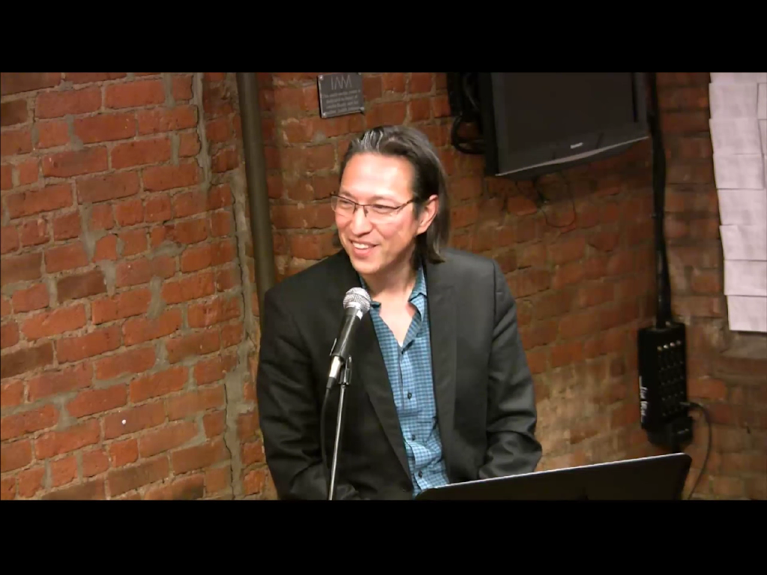 In the next lecture of the Art, Love, and Beauty series on Culture Care, Makoto Fujimura interviewed Jacob Marshall of the band MAE and MORE partnerships on the resources needed to start a movement. All three in the triangle below need to be present. Love is an impossibility if all we do is survive. We must acknowledge fear, guilt and shame. We seek what is impossible. Without faith it is impossible to create. Stealing in art is to incarnate the greater master in your own and requires love. Imitation is based in fear. Art is a faithful way of knowing the world and each person has their own unique path to that journey. It is Grace. We stalk on life (not just art) by standing under it, no over it. This is faith. Art is a faithful way of knowing the world. We need to link “what is art” to the bigger question “what is life”. We must abandon our lust for certainty and be on our faith journey toward the mystery of our being. We stalk and wait on our art. The assumption behind utilitarian pragmatism is that human endeavors are only deemed worthwhile if they are useful to the whole, whether that be a company, family or community. In such a world, those who are disabled, those who are oppressed, or those who are without voice are seen as “useless” and disposable. We have a disposable culture that has made usefulness the sole measure of value. This metric declares that the arts are useless. No-the reverse is true. The arts are completely indispensable precisely because they are useless in the utilitarian sense. 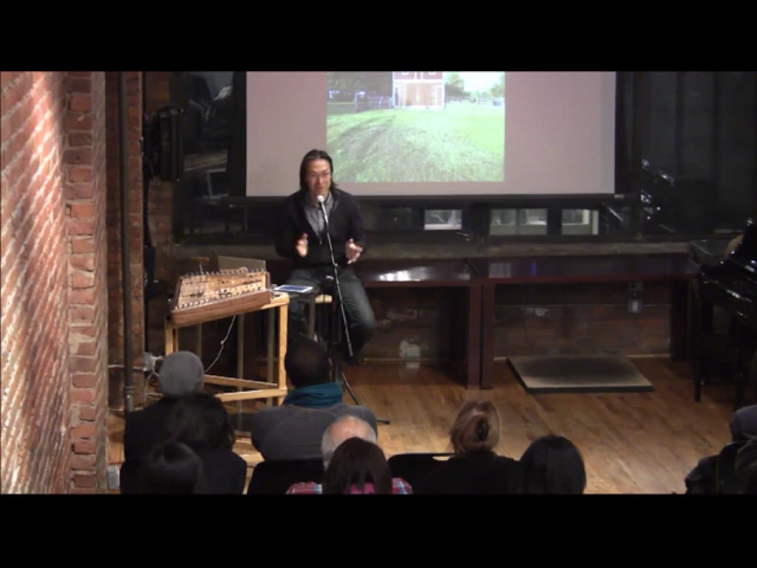 This is lecture 1 of a 6 part lecture series by Makoto Fujimura on Art, Love and Beauty. 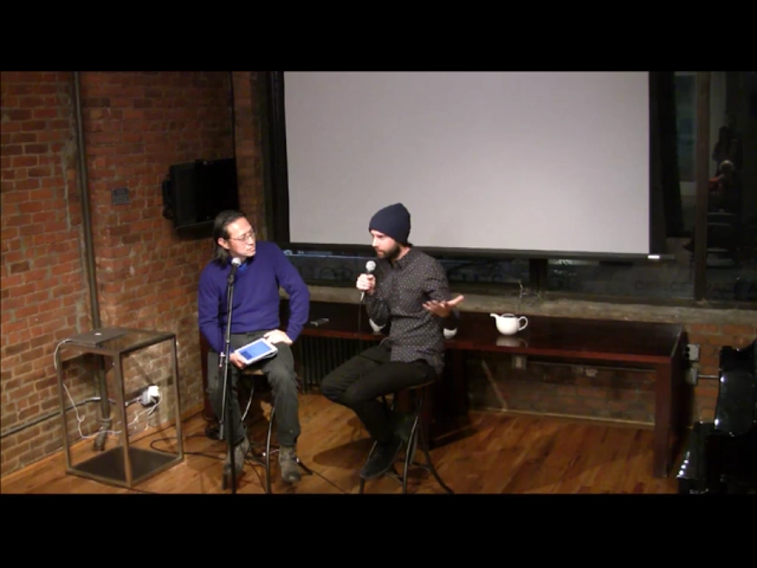 In this lecture broadcasted live from Space 38l39 in New York City, Mako explores the relationship between Art and Beauty. These lectures will pave the way to implementing Culture Care strategy in the IAM movement. The recently released booklet On Becoming Generative: An Introduction to Culture Care is an abbreviated version of Makoto Fujimura’s upcoming book Culture Care due to come out later next year. 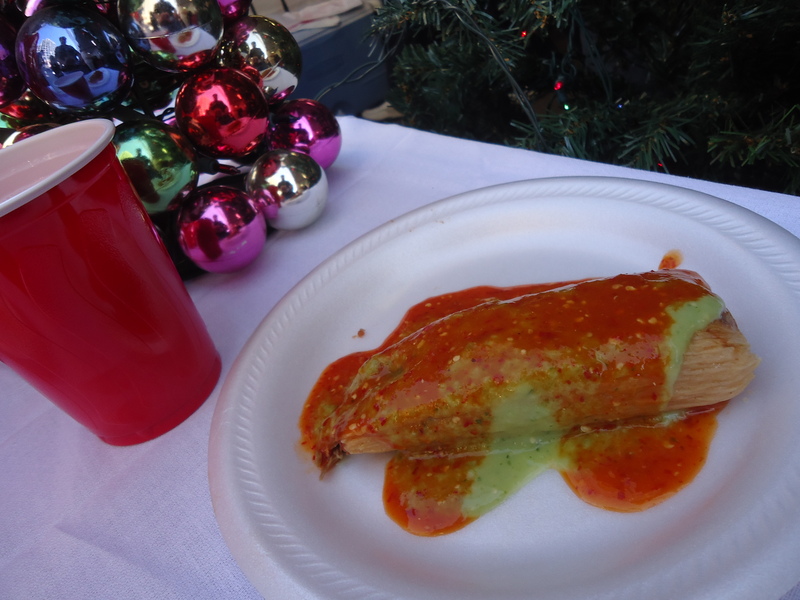 A tamale is a traditional Mesoamerican dish made of masa, which is steamed or boiled in a leaf wrapper. It can be filled with meats, cheeses, fruits, vegetables or chilies. I’m a huge tamale lover. It’s traditional for me to pick up a dozen or two before Christmas. I get them either from some of the hispanic ladies at my work or from Aunt Chilada’s. 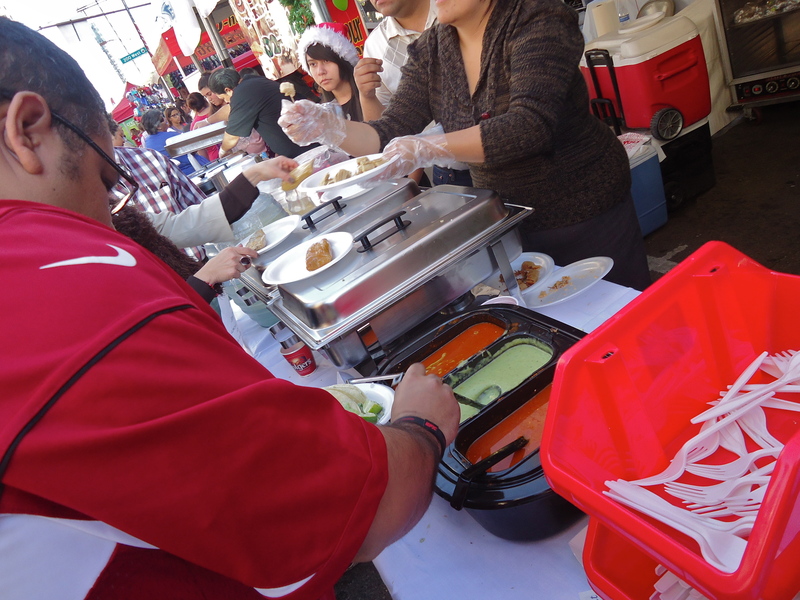 Every year before Christmas, Food City puts on this Tamale Festival. My mother wanted to go and we hung out and ate some good tamales while soaking in the hispanic culture. 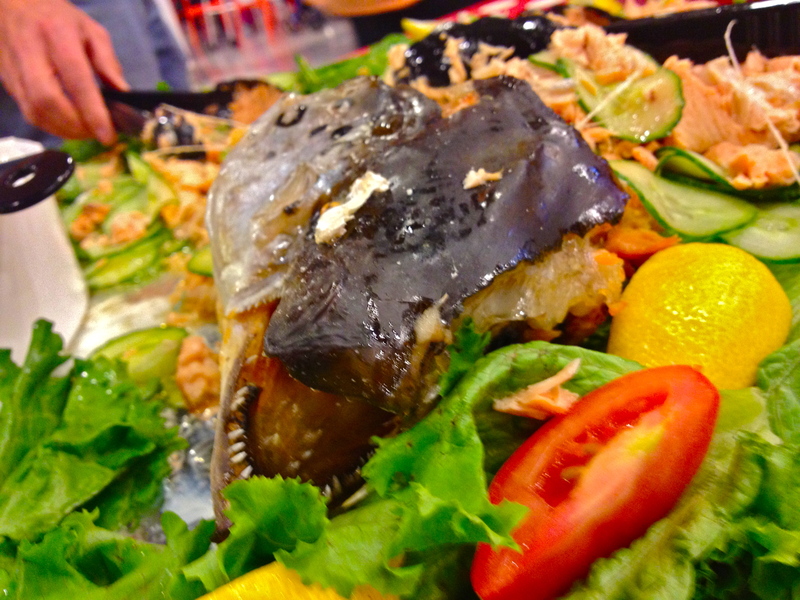 Smörgåsbord is a type of Scandinavian meal served buffet-style with multiple cold dishes of various foods on a table, originating in Sweden. 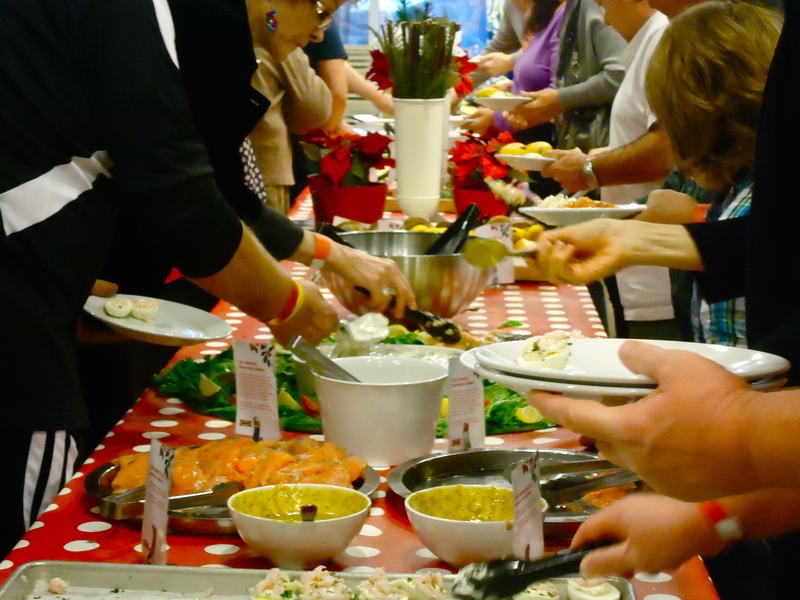 A julbord is a standard Christmas dinner in Sweden. 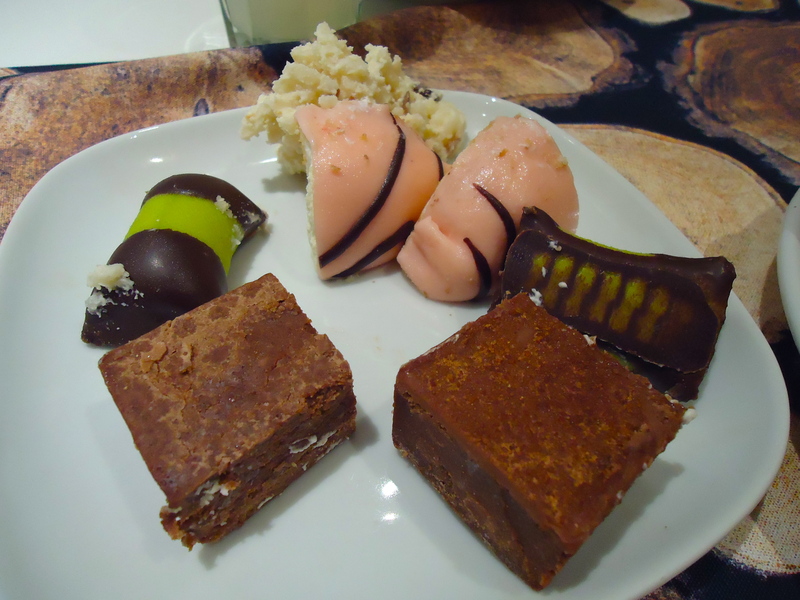 I’m half Swedish and tonight I tried my first Christmas julbord at IKEA. 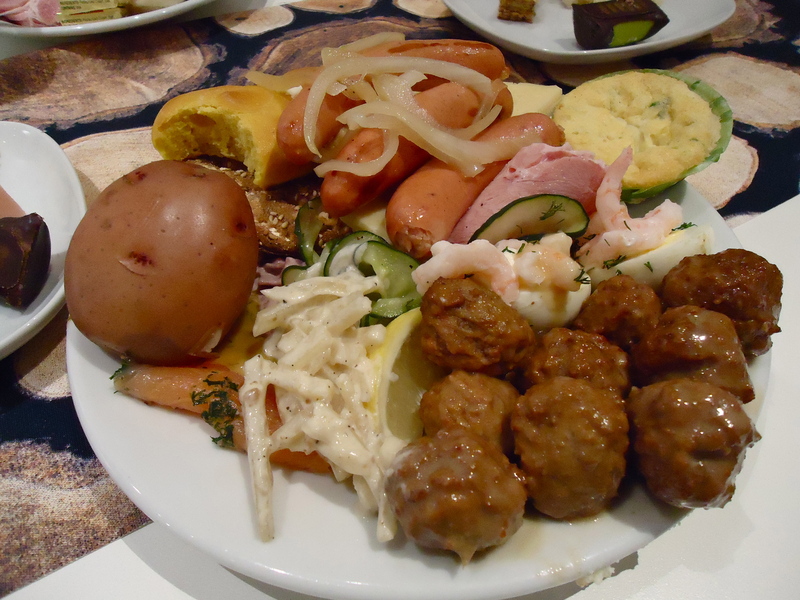 We tried herring, poached salmon, hard-boiled eggs with shrimp, meatballs, lingonberries, ham potatoes with dill, rice pudding and assorted cheeses and desserts. It was all very interesting and I’m glad I had a chance to try something new. Beaver Choice is a goofy name for a restaurant. But this little Scandinavian place in Tempe has some great food! I met my foodies’ small group here for dinner tonight. I had the popular Scandinavian Chicken Schnitzel Cordon-Bleau and a Scandinavian cookie. It was really good. The secret is that they cook everything with real butter. Probably not the healthiest of meals – but delicious if you want flavors. I was impressed and I look forward to a return visit.